Anneal's SkyPBX is a unified Skype PBX system that provide multi-Skype channels and IP PBX calling features and functions. Anneal's Skype Gateway SkyPBX/SkyGW Series is the next generation networking server that fully utilizes ‘SIP to Skype’ and ‘Skype to SIP’ technology for businesses to experience faster worldwide communication, lower telephony expenses, and operate flexible calling options. 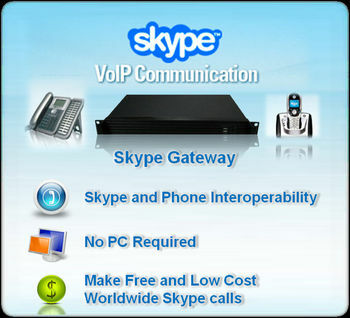 It is well-designed for SMB/Enterprise to enable multiple concurrent Skype calls through SIP or analog desk phones. Your company can establish a representative Skype account for employees to call office extensions from their Skype accounts for FREE or make SkypeOut calls from their company's Skype account. SkyPBX-880 provides 8 concurrent Skype channels, up to 8 FXO/FXS ports, and offers a built-in SIP Server to enable IP PBX functions. FREE extension to Skype calls, Skype to extension calls, and peer to peer Skype calls, can best be used for main office and branch office applications. This reduces communication costs significantly and speeds up worldwide communication. SkyPBX-800 is a unified calling system and offers a variety of VoIP applications, such as: auto-attendant, conference, call transfer, call pick up, IVR, voice mail, recording, and other IP-based communications. With SkyPBX-880, it helps business users to connect to their worldwide offices, business partners, sales contacts, and other large global networks using Skype. SMB/Enterprises are capable of making VoIP and Skype calls across the world conveniently with every type of calling device. * No need to install Skype software in office PCs to secure company information. * Provides Auto Attendant, IVR, recording, voicemail, Conference, etc.